It is finally spring! As temperatures (very) slowly warm up in parts of the country it is beginning to feel like spring too. With the fresh burst of sunshine comes the impulse to purge all things winter, it’s time for spring cleaning. 1. Make a Plan. Start by evaluating your home or your senior loved one’s home. Map out what you want to accomplish in each room. Checklists are your best friend. Gather the necessary supplies before you start a project. 2. Schedule the Time. Once you have your plan in place schedule when you want the cleaning to take place. If you are a family caregiver, don’t expect to get everything done at once. Use your plan to schedule a time or multiple times to complete your spring cleaning. 3. Recruit Family Members. Make spring cleaning a family affair. Recruit your family members to help you. When you have your plan in place you can easily organize people by room to complete the list. Asking for help is often difficult, but family members are usually willing and able to help, they just don’t know what is needed. 4. Purge Clutter. Before you start your cleaning take some time to de-clutter the house. Throw out expired foods and donate clothes not being used. Many seniors have spent a lifetime gathering belongings that are very meaningful and valuable so be sure to involve your senior loved one in the de-cluttering process. 5. Make it Fun! If you are like me and you hate cleaning, than making it fun seems nearly impossible. But, with the right music soundtrack and the right people spring cleaning might not be a total nightmare. 6. Include Mom and Dad. 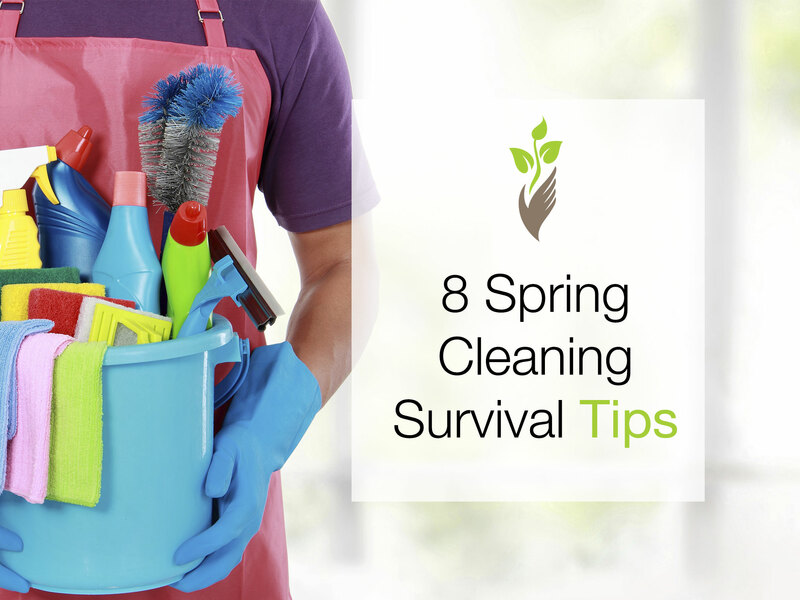 The quickest way to complete your spring cleaning checklist would probably be for you to do everything on your own. Yet, including your mom or dad in the process would give them ownership and a sense of accomplishment. Remember to continue to encourage the independence and dignity of your loved ones. Give manageable tasks for your loved ones to complete to help in the cleaning process. 7. Consider Senior Home Safety. As you are cleaning and de-cluttering your elderly loved one’s home consider the safety of the home. Do you notice cords running under rugs? Are hallways well lit? Are there grab bars in the bathroom? 8. Ask For Help. If you find yourself fully responsible for the spring cleaning of your parent’s home it may be time to start senior home care services. Care can be available from 1-24 hours a day to provide your senior loved one the care he or she needs. Services include homemaker care so you can have help completing your spring cleaning checklist. If you have questions about senior home care services in your area, contact a location near you to learn more.